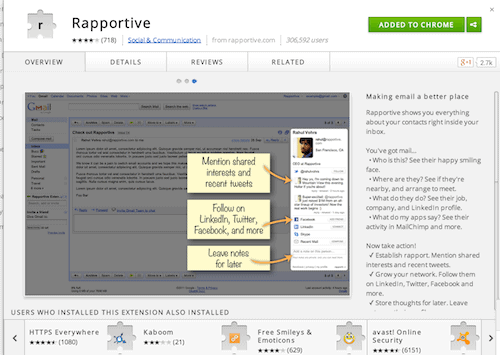 Rapportive is a genius Google Apps application that actually found a way to make social networking easier. To date, that has not been an easy thing to do. But somehow Rapportive nailed it. Installed as a browser extension, the Gmail app searches for social network profiles that contain the email address of the email you happen to be reading. Rapportive returns a mashup of the existing profiles. Not only that, Rapportive makes it easy to friend, connect, and follow that individual. You can invite the person to socialize with the simple click of a button. More important, Rapportive appealed to nerdier users who discovered it could be used for email verification. As Boolean Blackbelt Blogger Glen Cathey pointed out to recruiters and internet sourcers, Rapportive verifies an email address when it returns the social profiles and profile photo of the person you’re trying to reach as shown in the screenshot below. 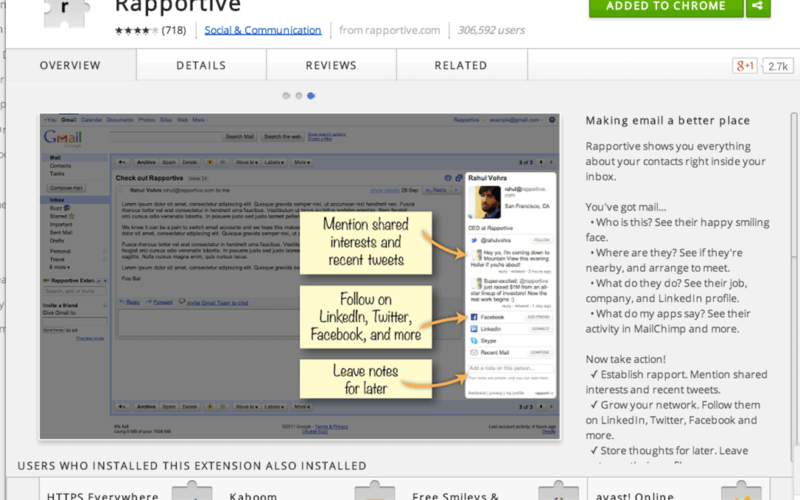 Well now, my friends, the Rapportive app that sits inside Gmail will be gone for good. LinkedIn says it is doing away with the “Rapportive contextual gadget for Google Apps”. LinkedIn’s announcement spells out the social network’s reasoning. At LinkedIn, we want to provide a simple and useful experience for members like you. From time to time, we take a closer look at how our features are being used by our members. On July 31, 2014, we’ll be removing 3 features from our Rapportive experience: Raplets, Notes, and the Rapportive contextual gadget for Google Apps. Please note: We are only removing these 3 features. Rapportive will continue to exist as a standalone product. By removing these features, we’re able to simplify the Rapportive experience. In other words, if you have Rapportive installed and if its the contextual gadget, that app has vanished. If you are a Rapportive user who entered notes in the application, LinkedIn disappeared your notes along with the Rapportive Google Apps application. We’re adding a deeper integration with LinkedIn so you’ll see more LinkedIn profile information and your shared connections within Rapportive. We’re also making changes to improve the product’s speed and reliability. Killing off a perfectly functional app raises concerns about the underlying motivations of LinkedIn. 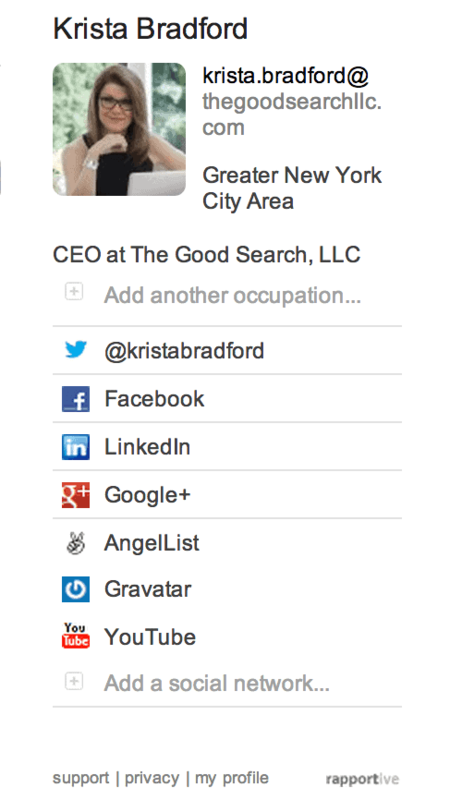 Rapportive serves up an impartial mashup of social profiles and contact data. Unlike Rapportive, LinkedIn is not an impartial player in the social networking ecosystem. The more LinkedIn controls or blocks access to member contact information and to other social networks, the more it forces us to use LinkedIn to do our networking. By throttling access, LinkedIn monetizes its business by creating demand for its paid services. We always want what we cannot have. LinkedIn ‘s greatest strength is also its greatest weakness. It is and must always remain a social network: that is the construct. So when it says or does things that run contrary to its social networking raison d’etre, member trust is shaken. I don’t object to LinkedIn monetizing its business. I object to LinkedIn behavior that contradicts its stated purpose as a social network. For instance, LinkedIn has done things that suggest it has set a strategy to make it hard for members to share data with the very people with whom they want to share it. They block and impede access in a variety of ways. For instance, LinkedIn doesn’t let members export phone numbers that first-degree connections have shared with us. While you can see the shared phone number sitting right in front of you in the LinkedIn profile online, there is no easy way to get it out of LinkedIn. And that’s not all. Take a gander at the personal details that your connections have chosen to share with you in the Contact Information section of their profile. There you’ll find multiple email addresses and phone numbers, IM aliases, hyperlinked Twitter usernames, linked websites, home pages, and blogs. You’ll find members birthdates and LinkedIn profile URL. Yet LinkedIn limits the export to its stripped down version of “name, rank, and serial number.” It only allows the export of just three fields: Name, Title, Company. Social networks are supposed to help us cultivate mutually beneficial relationships. Yet, LinkedIn is more a one-way street. While LinkedIn has blocked access to the data members want to share with us, the social network allegedly has dipped into member data that members they did not share. In fact, some members sued LinkedIn for the improper use of their data. A judge refused to dismiss the lawsuit against LinkedIn, which claimed the company violated customers’ privacy rights for marketing purposes. The suit alleged LinkedIn did so by accessing their external email accounts and downloading their contacts’ addresses. LinkedIn is also throttling member access to job opportunities. Because LinkedIn monetizes its network through recruitment services, the company refuses to give other recruiting solutions access to data that members want to share. That means fewer opportunities for LinkedIn members. Moreover, LinkedIn is a Goliath that is willing to go to court to sue emergent recruiting solutions. HR Examiner reported, “Linkedin filed a lawsuit against unknown defendants claiming that someone was creating fake accounts so they could exceed Linkedin’s allotted page view limits and take information from user profiles. Linkedin claims unauthorized use of Linkedin’s computers, copyright violations, and breach of its Terms and Conditions. A copy of the lawsuit is here.” The article goes on to say that LinkedIn amended the suit and named two defendants, HiringSolved and SellHack. Matt Charney, one of the owners of SellHack, contends SellHack was not doing anything illegal. Did you know you were granting a licensing ALL of the information you provide to LInkedIn? Didn’t think so. That legal sleight of hand is what inspired employment lawyer Heather Bussing to “kill” her LinkedIn account. So far, her rejection of LinkedIn is an outlier. Yet trust is a tricky thing. As the author of the Cluetrain Manifesto David Weinberger has written, social networks consist of small pieces loosely joined. It is a kind of connection, that while infinitely scaleable, remains incredibly fragile.